From long-haul truckers to school districts to local food producers, Samsara customers serve a wide range of industries - yet share many of the same concerns. One of the most common ones we hear about is improving route performance. Today we’re excited to announce enhanced route tracking and new in-app messaging to make your fleet’s routing and dispatching even more efficient. Managing routes is a time-consuming, stressful challenge for fleets. A bad route wastes fuel, causes unnecessary vehicle wear and tear, and takes time away from other jobs. 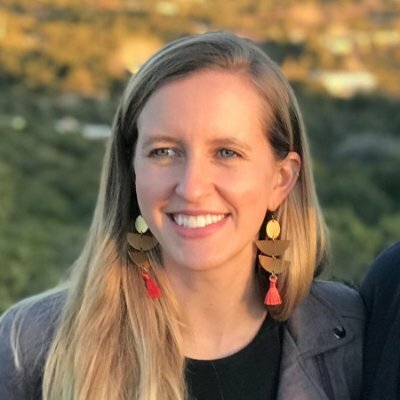 Typically, route planning software uses traffic data, census information, and algorithms to build routes, but they rarely analyze the results. What actually happened on the route? Is one stop perpetually behind schedule? Or does one pickup never show? Samsara offers unprecedented visibility into active routes. In our unified dashboard, users can see estimated arrival times, completed stops, and whether or not a route is running behind (or ahead of) schedule. Using precise geofence technology, Samsara detects when a driver is approaching a stop and automatically marks stops as missed or complete, eliminating the need for manual check-ins. Our Route Analytics report sorts routes based on performance, so that managers can quickly identify areas of improvement, as well as high-performing routes. Dispatchers can update routes on-the-fly. So, if you’re a dairy delivering milk and a store unexpectedly closes for the day, a dispatcher can remove the stop to instantly update the driver’s navigation. These new features save time and money. Beyond ROI, they also reduce the daily stress of routing. A last minute cancellation or frantic call doesn’t have to disrupt your day. With our trip sharing tools and real-time arrival alerts, Samsara customers can dramatically reduce the number of calls and inquiries about route status, delays, and estimated arrivals. Using Fleet Viewer, customers can create unique, shareable links that include tracking information and estimated arrival times. Now, parents can monitor their children’s school bus, riders can check on their approaching shuttles, and customers can track when their delivery is scheduled to arrive. 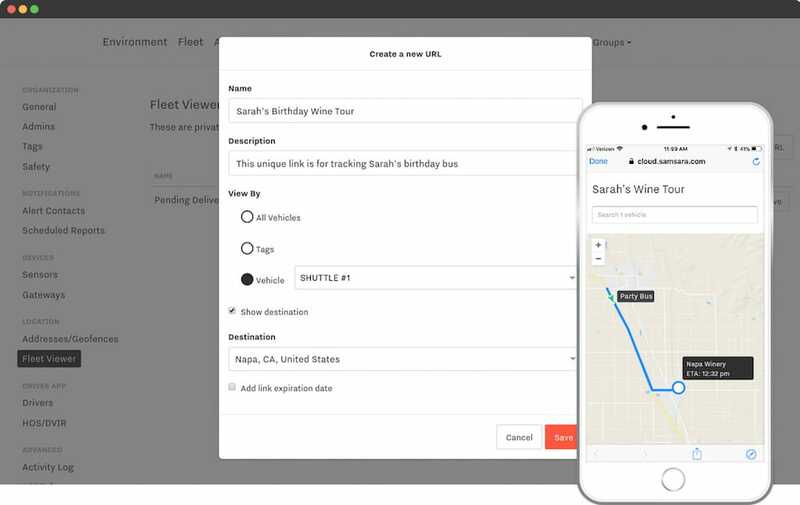 Samsara's Fleet Viewer lets customers share unique, vehicle-specific tracking links. Using time-based arrival alerts, fleets can send email and text notifications to relevant customers or recipients when a vehicle is approaching a particular stop. This is especially valuable for customers who need time to prepare for large deliveries or who welcome arrivals in person. We’ve heard that small updates like these can have an outsized impact on customer service and the ability to win new business. Our all new in-app messaging streamlines communication between dispatchers and drivers. Dispatchers can share route changes or hazardous conditions with individual drivers or an entire fleet - all without picking up the phone - and drivers can read and respond to messages using the Samsara Driver App. Drivers value in-app messaging because it separates work communication from personal texting. Drivers no longer have to use personal cell plans or phones and don’t have to constantly toggle between apps for messaging and navigation. 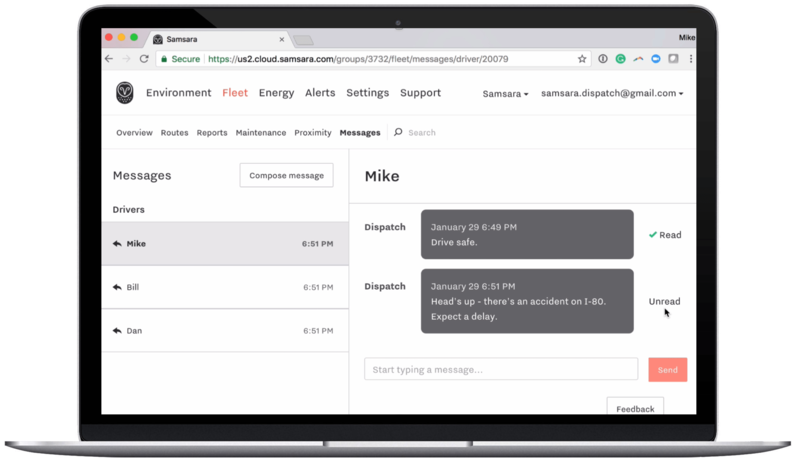 Until now the Samsara Driver App’s main use was for Hours of Service (HOS) management, but the addition of in-app messaging and routing turns the Driver App into a centralized hub for all driver activity. Now drivers can record their working hours, submit DVIRs, track their safety score, read and respond to messages, and receive turn-by-turn route navigation. To cap it off, since Samsara’s Vehicle Gateways come with built-in WiFi, the app doesn’t require a company cell phone plan. It’s an end-to-end solution with no hidden costs. We’re starting to roll out these new routing and messaging features to existing customers. Reach out to your Samsara rep if you’d like early access. If you’re not a customer yet, sign up for a live demo to experience Samsara’s fleet management and routing technology.